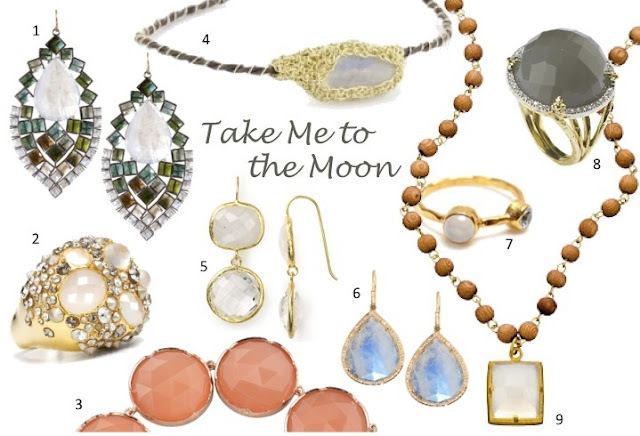 Enchanting and feminine, I'm currently craving moonstone jewelry to play off this season's pastels. In many cultures moonstones are considered to have magical powers; not hard to believe given their mysterious play with light and soft shimmer which changes as they move. Popular 100 years ago during the Art Nouveau movement, jewelry designers are once again starting to embrace this complex gemstone and incorporate it into their designs both traditional and contemporary. From encrusted rings to delicate drop earrings, moonstones make the perfect jewelry for a romantic warm summer evening. Oh no, no you didn't. Jewelry is my biggest vice! I've always loved moonstone - It's so mysterious! 2 and 8 - LOVE!!! I love these pretty jewels- especially that #8 ring! Gorgeous!! Thanks for sharing these beauties! I love them all, but number 6 is my favorite. XOxo V.V. Those are so beautiful! the cube no.9 is my fave! lovely! I love jewelries... It seems fabulous! Amazing post dear and gorgeous blog! I would like to invite you join my Romwe giveaway: you can win a pair of sunnies and 60$ freebies! these are all pretty! love the ring, no.2! happy weekend! wow! what a cool story. It makes them that much more beautiful! The ring at number two is amazing, I love it. Love No2! Wonderful colours for this summer, so light and feminine! I love #4 as well. I never think about this stone - awesome post! Happy weekend! Loved it....very beautiful & unique patterns!! Hi!!! Thanks for stopping ! Kiss and have a nice day ! What a lovely selection. I especially like the second ring.